Wow! What a weekend of ups and downs and challenges…which all started on Thursday. On Thursday I had my follow up appointment with my gynaecologist and I mentioned to her that I have been having a pain that feels like something is pressing on the left side of my lower abdomen, and every now and then a sharp pain that sometimes makes me double over and gasp. She explained that sometimes there can be a build-up of fluid on the ovary side of the clip that was put on fallopian tube. So I’m off for an ultrasound on Friday and then another appointment with my gynaecologist Thursday week. I learnt some more about my endometriosis as well. It was not just a little bit, but is at stage three. There are four stages from one to four with one being the least amount of endometriosis and four being the most – although the amount of endometriosis does not equate to the symptoms or pain a woman can feel. A woman can have stage one and be in a lot of pain, while a woman can have stage four and not feel anything. It seems I have stage three with much of the endometriosis in places where it cannot be removed. I’m not sure what is going to happen from here, but much will depend on the ultrasound findings, but possibilities are further surgery and a possible hysterectomy. Which I do not want. I definitely do not want a hysterectomy if at all possible. Friday I was one very unhappy chicken. When I went in for the uterine ablation and the clipping of my fallopian tubes I was looking forward to a simple procedure which would leave me with far less monthly bleeding and therefore an increase in energy. I was really excited about feeling good again and being able to get on with life. But, as can happen with all of us, it wasn’t so simple and things still aren’t sorted out. So – Friday. 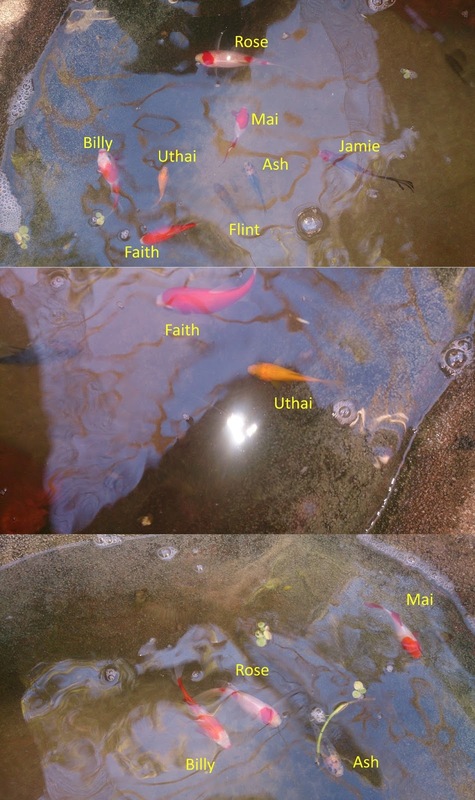 I went out to the pond to find one of my fish, Sahmi (a golden comet), had died – he lived in the little pond with Uthai (another golden comet), and Jade and Jasper (my catfish). As my regular readers will know I love my fish. They all have names and they are very friendly. I had to do a water change in both of the fish ponds and so I did that and put the fountain back in the bigger pond. I went inside to do some other things that needing doing. Later I went back outside and my big pond had tipped over and much of the water was gone. The dirt underneath was a quagmire and the pond was floating. I panicked as I couldn’t see my big fish (Rose, Ash, Billy, Jamie, Flint, Gertie, Myrtle, Faith, and Mai). I pictured them having gone through a hole in the bottom of the pond and having disappeared somewhere in the mud. I ran into the shed and grabbed the first plastic box I could find to put any of the fish I could find in. While doing so I shut the garage door on my thumb – ripping some of the skin off and bruising my nail. It was very, very fortunate that as I emptied the big pond I found each and every one of my babies. I rang Kirby in tears – I just didn’t know how I was going to cope. Being the amazing man he is, he talked me through my feelings and suggested sitting down with a coffee and doing some deep breathing. I did so and felt much better – although my thumb was really hurting by this stage! Onto Saturday. Kirby and I found that the area beneath the pond was extremely soggy and far too soggy to put the pond back in, unless we wanted it to float and tip over again. Kirby’s Dad came over and suggested we put two large holes deep into the ground and fill them with gravel so that any water would drain away more easily, now and in the future. Kirby did this, but by Sunday the ground still hadn’t drained enough to put the pond back. On Sunday we decided that the best option, as the fish couldn’t stay in the containers for much longer, would be to empty the little pond and put Uthai, Jasper, and Jade into the big pond. And then we could put the big pond where the little pond had been (on stable ground) for the time being until the water in the big pond hole drained away. I began emptying the little pond. Uthai was easy enough to catch, and being the easy going fish that he is he was quite happy in the container I put him in until the big pond was ready. As I emptied the pond further I started getting worried as Jasper and Jade were nowhere to be seen, which was unusual as they are curious and like to know what’s going on – especially Jade. I eventually found Jasper. He was dead on the bottom of the pond. Then I found Jade, she was very ill and on the bottom of the pond. I burst into tears and it felt like nothing could stop my heart from breaking. The endo, the possibility of future surgery, the fact that our kids had more of a chance than the IVF clinic had given them, and my fish. It was far, far too much to take on. I actually had a dream on Saturday night (before I found Jade and Jasper) that I was in a room with some other women and there were darts, daggers, and spears sticking out from the walls. The people in control said that every now and then, with no notice, the weapons would be shot out into the room and some of us would be injured and possibly die. The only way out was to pass some tests. One of which was to be able to communicate with a dog, but I don’t remember the rest of the tests. It was really frightening – especially when I had passed a test (the dog communication one) but still had to go back into the room, with the possibility I would die, before I could do any further tests. I’m still thinking about that dream. It is one of those ones that seemed to have a message from my subconscious. Pretty yucky weekend all around. Then, last night, something happened. I didn’t want to go to bed as my mind was racing and I was crying a lot and I didn’t think I would be able to sleep. I decided to go outside, in the cool darkness, and look up at the stars for a while. At first I could only see a few stars, then more became visible, and eventually I could see the white mist of the Milky Way. I thought to myself – the Milky Way is so vast, and then there is this universe beyond that. One of the stars I could see is 1340 light years away, which means the light I was seeing left that planet around the year 670AD. The time before me and the time after me is fathomless. I’m tiny, I’m a blip (less than a blip really). My life is nothing in the vast scheme of things. Instead of making me feel unimportant and worthless I felt a weird sense of freedom. If my life is so small and I am a speck of dust, then why do I worry about so many things? Why don’t I feel the sadness, the happiness, the love, the hate, without judgement? Why don’t I just get on with my life as it is? If I don’t really matter in the big picture then maybe I ought to live my life without all this worry and speculation and wondering what other people think of me and how messy the house is and trying to work out how I can control what happens to me. All I need to do is live the best I can doing what I believe is important. That’s all I need to do. I can still feel the fear and loneliness, but I need to learn to detach from them so I can see them for what they are, and not hold onto them when they are no longer of any use to me. 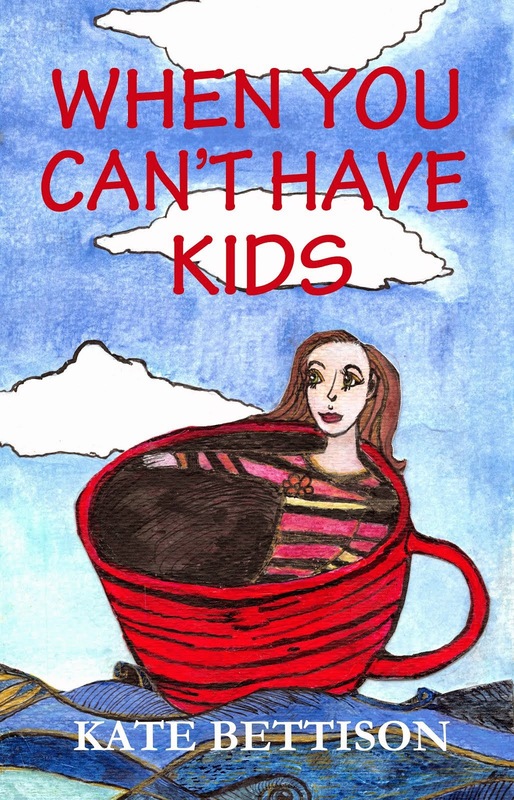 I can still feel sorrow at the loss of my fish and that our children were never born, and I can feel anger at the IVF clinic. But, I need to realise I don’t have control of everything – or anything perhaps. There is a freedom about this and all I need to do is embrace that freedom. Ugh. I'm sorry that it was a rough weekend and about your fish. It's so hard to loose something we love so much. I've suspected that I have endo for years but can't seem to find a doctor who is keen to investigate. What (if any) are some of the symptoms that you experience? I'm really curious. I'm really sorry you've had such a tough time recently, but loved the ending of this post. When I accepted the randomness of this vast universe, I also felt a real freedom. Still do, really. It's a wonderful thing. Love the photos of your fish with their names. I could have sworn I commented on this post, but trying to write on an iPad lying in a prone position doesn't always work! I'm so sorry your lost your fish. I know that with my ectopics, when I realised I was mortal and unimportant, I felt a real freedom and liberation. I think that might be similar to what you're feeling. I like that you did it with the stars though. I love stars! Sorry for the delay in publishing your comments...thanks Mali - the stars are very comforting. BentNotBroken - I've put a link in my blog entry today to a really great website on endometriosis.